I'm pretty obsessed with coconut milk and warming spices lately. I'm also loving my whole grains and I stocked up on beans. I can't wait to share this savory bean dish with you. Are you up close and personal with tumeric and curry powder? You should be! These spices give food such awesome flavor and are great paired with coconut milk. 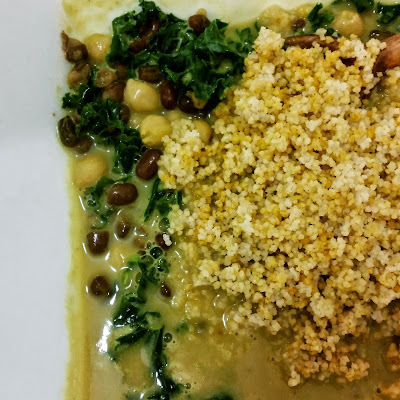 Feel free to use any whole grain for this recipe; it doesn't have to be couscous, it can be rice, buckwheat groats, barley, etc. I used light coconut milk to cut down on fat and I used kale as my green; feel free to change this up as well. Make your couscous according to the package. Pour the coconut milk into a medium pan and turn the heat on low. Add your beans and stir. Add in your tumeric, curry, garlic and sea salt. Sprinkle just a little bit of everything into your pan and then taste. Start with 1 tbsp of tumeric and curry and go from there. Don't oversalt the dish either. As long as you love garlic, you can put about 2 tbsp of that in. Keep stirring and taste testing. Once the spices are how you love them, chop your kale into small pieces and add it to the pan. Stir the kale into the coconut milk mixture. Another option is steaming your kale separately and adding it to the dish last. Keep stirring and tasting. Once the couscous is done, you can spice it up as well. You can also add some couscous to the pan of curried beans....or just place the couscous in a separate bowl. Add some sea salt and curry to the couscous. Once everything is stirred in, turn the heat off and pour the curried beans and kale into a bowl and serve with the couscous. Such a delicious and yummy meal to warm you up on a cold, snowy day. Tumeric is said to have anti-microbial and anti-inflammatory properties and other health benefits. It is being studied to see if it can be used to fight certain diseases. Branch out and try new spices. Have a wonderful Wednesday! !